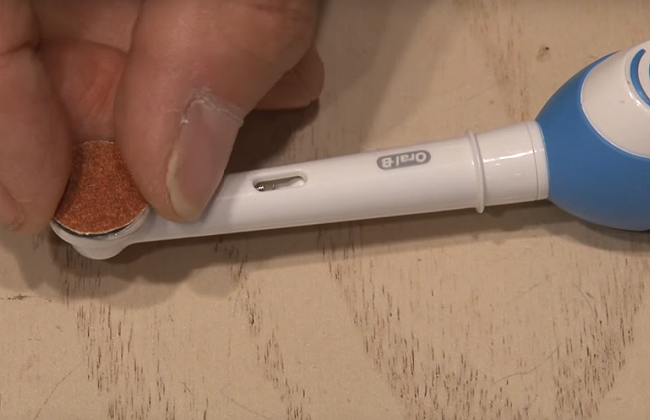 Want to put a new spin on your old electric toothbrush? Transform yours into a pint-size power sander that can tackle small projects at home and in your workshop—for just $5! Power sanders are incredibly useful—and incredibly expensive. The smallest versions, called detail sanders, allow you to maneuver in tight corners like a pro. With a light touch, you can use these tiny power tools to sand away scratches in old furniture, perfect painted trim, smooth rough edges in wood—and even deep-clean grout! In an effort to get all the function without the hefty price tag, YouTube guru and professional tinkerer kipkay built a simpler sander from an electric toothbrush for just $5. 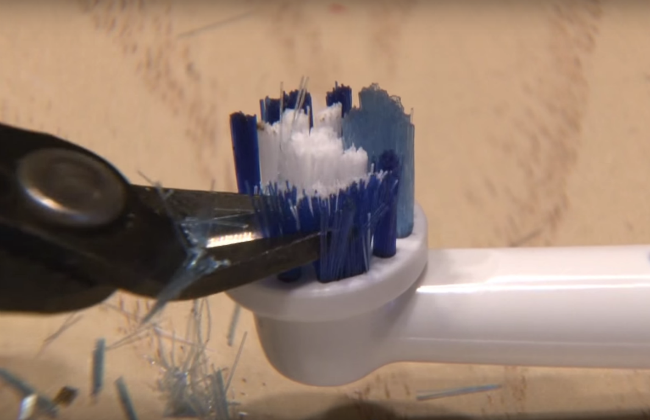 He first hacked off the bristles with a small pair of scissors, then cut a piece of plastic from an old DVD case to cover the empty patch on the toothbrush head. (This scrap plastic creates a smooth base for attaching the sandpaper.) After coating the top of the toothbrush in superglue, kipkay pressed the piece of plastic in place for a few minutes to create a strong bond. Finally, he added a cut-to-fit circle of adhesive-backed sandpaper to the top of the toothbrush, and prepared his to-do list of around-the-house jobs. Just like a detail sander, the oscillating head of the electric toothbrush wears down surfaces in small circles, or “orbits,” so you’ll need to move it back and forth for an even, smooth finish. Inspired to take your old toothbrush for a spin? Check out the settings before you get started—most have more than one, so test all the options before diving into your next big DIY.